Maximum DVB-S2/S2X LDPC-baudrate for all 8 tuners: 720 MBit/s. 4) Maximum DVB-S2/S2X LDPC bitrate is limited to 720 Mbit/s. This bitrate is defined as symbolrate * bits/symbol, i.e. 8PSK 30 Msymbols = 90 Mbit/s. The used bitrate is dynamically allocated by the driver. DVB-S channels don't contribute to the limit. 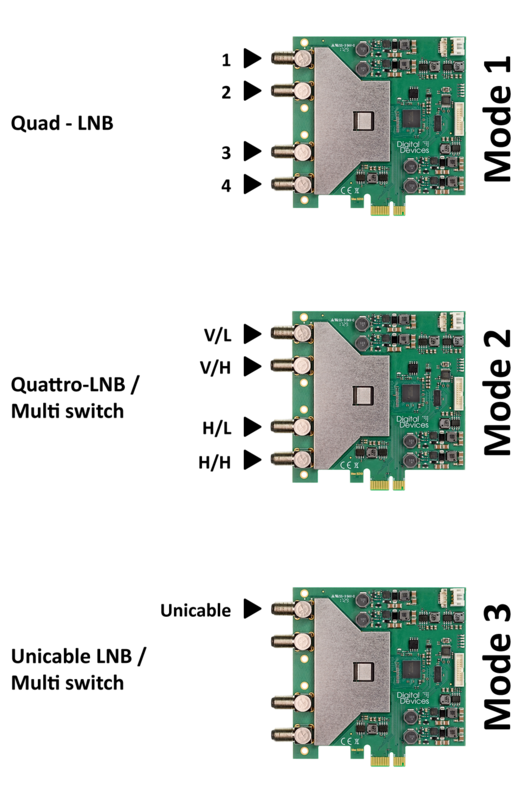 The Digital Devices MAX SX8 is a tuner card with 8 HDTV tuners on a single card with PCIe connector. The high density of the design and the choice to select the operating mode as well as Unicable® and JESS® support and only 7 watts power consumption makes the card ideal and flexible for DVB-S/S2/S2X applications. Using the “Quad” mode the card can either be connected to an LNB or a 4x multi switch. It supports one satellite.